The environmental issues in India become more serious every day and she is turning into a bit of a mess on this front but with a serious lack of education and over 1 Billion people, a huge amount of which are in dire poverty, it's hardly surprising. The recent boom in its industries, little or no environmental education, infrastructure nearly at bursting point not to mention the huge deforestation that's going on. If you think your country has some problems then you are about to be a bit of a shock because I'm sure nothing compares to some of the environmental issues in India. A whopping 65% of the land in here is degraded in some way, shape or form and the endless government policies do little to curb the damage. In fact, there is no shortage at all of government legislation protecting the environment but unfortunately it is never enforced due to flagrant abuse of power, corruption and lack of resources. If you have ever been to India you have undoubtedly noticed the serious little problem that they have in India. No, it's not like here in the UK where a can of coke and crisp packet on the floor are a litter problem. India's litter problem is almost a bit disturbing. The attitude is to just throw it on the floor, there are no bins, just drop it. That's 1 Billion people disposing of their rubbish on the floor, every day. The scope of the problem is almost unimaginable and of course, it takes generations to change a habit like that but no one is starting. What they need here is education and that is what is seriously missing. With regards to environmental issues in India, India appears to be digging its own grave deeper and quicker than the rest of us, nearly 30% of India's gross agricultural output is lost every year due to soil degradation, poor land management and counter productive irrigation. The wetlands and lakes are also being hit hard. Mainly by the industrial boom that hit India a decade ago, the main problems being improper disposal of industrial waste like chemicals etc. India's 7516 km of coastline have also come under attack from this environmental sabotage, overfishing remains a huge problem due to lack of legislation enforcement. Raw sewage from an awful lot of people is pumped endlessly into the ocean along with other industrial waste and chemicals. Hundreds of miles of coral and other sea life are slowly being destroyed due to offshore drilling. Tourist centres such as Goa suffer due to badly managed development and excessive tourism, again resulting from the lack of legislation and policy enforcement. The Environmental issues in India are huge. Whether it's the rapidly dropping water tables, mass deforestation, land degradation or river contamination, India has it all and on a massive scale. Below you can find information on all of India's most serious environmental problems. Perhaps the largest of the environmental issues in India facing the people of India is inadequate or lack of access to vital fresh water resources. As India's industries get bigger so will the amount of water they require and the amounts are already beginning to spiral. As an example I use the Coca cola factory which was accused for years of messing up an entire eco system. By simply diverting all the water to their factory, millions of people went without. The company are also accused of causing huge droughts and contamination to a massive area by exploiting an excessive amount of ground water and then replacing it with toxic discharge. Of course, Coca Cola is a big famous company and that is why this came to news but I have no doubt that there are a million examples of similar things happening all over India. Years of exploitation and extraction of groundwater in India has caused the national water table to suddenly and very dramatically drop. Considering that 85% of rural drinking water and 55% of urban water comes from underground sources, this seems to me a very urgent problem as literally hundreds of millions of people could be left without water...does it even bear thinking about! The rivers are on the front line of pollution in India. Millions of people depend on them for their livelihoods but they are slowly being polluted and destroyed by sewage, chemicals and other agricultural and industrial waste. These are some of the most polluted rivers in the world but little seems to be to stem the incessant destruction. The story of deforestation is another of the highly serious environmental issues in India. It is predicted that almost 5.3 Million hectares of forest have been destroyed since the independence. Most of it being chopped down for housing, industrialisation and river projects. It is estimated that the number of Mangrove Forests have more than halved in the last 20 years. The government soon recognized the importance that these forests hold for the conservation of soil and put forward a range of polices trying to curb the destruction; of course, nothing has really changed and thousands of acres are destroyed every year with nothing in the way of 'replacement'. Poor management and abuse of power are again the increasingly sad cause behind the mass deforestation of India, some call it greed. Protected areas are largely declassified so that commercial activities can take place but new areas are not reclassified. Poaching is another factor, people actually coming in and steeling trees and one of the final blows to the forest of India who already seem to have lost the battle is the invasion of foreign tree species such as Eucalyptus etc. India now has one of the worst qualities of air in the world. Without a doubt the main contributor of air pollution in India is the transport system. In the big cities like Delhi and Mumbai, millions of old and very dirty diesel engines churn out millions of tonnes more sulphur than their western equivalents partly because of being old and partly because of the diesel. As a result, the asthma rate for children in some of the larger cities is now at %50 and rising fast. Because of the varied causes and consequences surrounding this topic, I've devoted a whole page to India air pollution. I have already touched on the massive problem of waste disposal but I intend to go into it more here. It seems that some areas are simply fed up with the lack of Government intervention and are using there initiatives. As an example I use some of the towns and villages in Kerala who are seeing a return to the old paper bags from plastic ones. As I am sure you know, plastic isn't in any urgency to degrade but the people of India don't seem to recognise this as they throw every unwanted item onto the floor wherever they are. 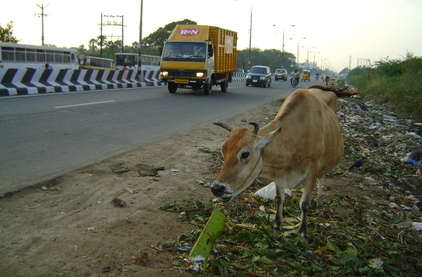 Of course, the victims of this environmental issues in India are the future generations and the animals. 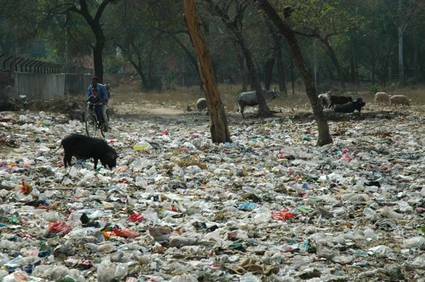 The holy cows that are so integral to Indian life are slowly being killed from the huge amount of plastic bags they consume that eventually rap around their insides. On A brighter note, solar power in India is going through a boom along with several other environmentally friendly power sources. Follow the link above for more information about the solar revolution in India.